This morning we continue the visit of the city, the first monument we see is a military transport aircraft (An 12) on a place with some plays for children. Then they take us to the monument dedicated to the deads of the Nedelin’s Tragedy. It’s a small obelisk around of it is registered the name of the victims and the pictures of some. Just behind is another monument also dedicated to an accident of a missile. Then, Victor takes us to a few hundred meters further at the foot of the monument dedicated to the science. It’s a large statue of a woman carrying the Earth in one hand and the furrow of a spaceship in the other. It is standing upright on a large red column. To finish the visit of the city we see the orthodoxe church located at the East of the city. The minibus arrives at twelve past thirty on the carpark of the Progess integration building, we meet Lisa on the spot, our interpreter. As time passes we see arriving buses fills by Russian schoolboys or Koreans and cars. To help us waiting Victor gives each one of us a press kit. Around a quarter past thirteen it takes us to go round the building and we enter on the carpark where the crew submits his report to the state commission. We walk between the two buses who will lead them to the launch pad and we enter the building to go in the preparation room that we had seen, empty, two days ago (after the roll out of the rocket). The room is crowded and big television cameras prevent us from well seing the cosmonauts. We wait the end of the dressing of Yi, sitting in the Soyuz armchair, the technicians tests the airtightness of her suit while her colleagues takes pictures. A few moments after they seat down at the table and answer some questions to the journalists. While leaving the carpark I cross the technician who had made us the visit of the universal launch pad the day before, reconverted in security agent, I chat a little with him, then I move towards the stands. There is no more room available, the Koreans came in number and they agitate shirttails and sing songs. I find a place in the forefront with a good angle of view, hoping that nobody comes in front. 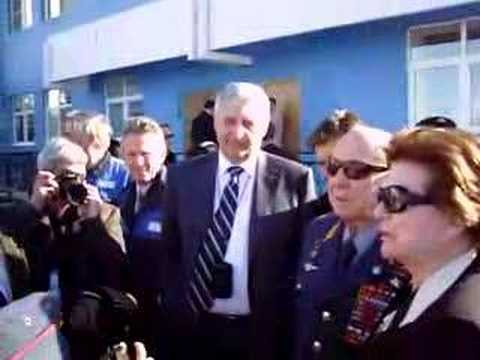 But progressively VIPs arrive, official journalist, members of the State Commission, cosmonauts, guests… they are so many that at the end I will not see anything. Leonov and Terechkova arrive a few minutes before the report, he is in his military suit. At the rear we can see Krikalev. Leonov faithful to himself is a real tourist and with his camera shoot everything, but especially the Korean supporters (I am sure he has never seen so many people unchained during the crew report to the state commission). The crew leaves the building and advances towards their respective marks, they submit their report, then go away to the the buses, on the steps they say goodbye to the crowd. The Russians, as usually, do not smile and only Yi shows her joy. They seat down close to the windows and while the buses leave the carpark, Yi continuous to make signs to the public. To finish our visit of the cosmodrome we went to the Baikonur’s museum, located in aera 2. It’s a modern building where stand a splendid Soyuz at the entrance. At the outside is a test model of the Buran program, a RD-0120 engine and an old radar model. We begin the visit by the rooms at bottom mainly occupied by an immense model of the cosmodrome. On the level are other rooms with the first pursuit computers of Baikonur, a space capsule for the first tests on the dogs, a spacesuits and many other things. The guides (there is a guide by room) only show us a small part of the models and exposed objects, but it would take the whole day to see the totality of this splendid museum. At the outside there is the test model OK-M of the Buran program. It was repainted with the colors of Buran 1.01 and is now much more pretty than 2 years ago. The payload bay was entirely arranged in exposition room dedicated to the project Energia-Buran and a model of satellite was put at the rear. The entrance towards the cockpit is possible through a circular door which lead on the lower deck (at the place of the air-lock for Extra Vehicular Activities). I’m coming close to the guard and ask him if it is possible to enter, but he makes no with his head. While going down from the staircases I find our interpreter, Lisa, and asks her to help me get inside, she asks him the question and he accepts immediately, that helps to be the wife of the chief of the Baikonur’s police force! But the guard asks us to be quick. We enter on the lower deck which was arranged in small projection room (two lines of seats and a flat screen on the wall), a ladder is located near the original entrance it allows to go up on the upper deck. The inside was not entirely remade (normal because this model did not test the cabin) the bolted aluminium plates are visible and the dashboard made from scratch seems to come from a bad science fiction movie. It is now sixteen past thirty it is time to move to the observation site to see the launch of the Soyuz rocket. On the way we eat a little even though we are too excited by the launch. Arrived on area 18, radar following zone, (about 1km to the launch pad) there is already many people and the Koreans still run everywhere like this morning with their flags. Didier and me find a place at the side of a platform where the view to the launch site is clear. Our only fear is that somebody stand in front of us, indeed televisions had the right to be placed behind the fences. This zone is slightly elevated compared to the launching pad so we can’t see the bottom of the rocket. On the spot there is no countdown nor even a commentator, but some Russians beside us inform of the remaining time before lift off. We wait as we can because we are very excited by the event, then the service tower take back, it remains only few minutes. Normally it should not have have deferment. Two minutes before the launch silence is impressive, we can only hear the sound of the wind. We are very close! Then the umbilical is taking back, a few seconds later we can see smoke from the deflector, and ice falling down from the central body. It takes off!! slowly the tulip opens and releases the rocket which go, at last we can hear the noise, the noise is very strong and hit us like a wave. This noise, paradoxically, looks like the one of a bad moped. The light on the tailpipe is dazzling it is difficult to look at it. The rocket goes faster and faster and the noise tone down and quickly we can only see a light in the sky. It’s finished, it tooks only 30s, but what a vision! People applaud and the generals are pleased. We can see going down from the official bench the second crew, Vinogradov, Volkov, Leonov, Tereshkova and many others. Those last comfort Mr. Suraev and O Skripochka of the second crew which were very moved. Slowly people leave the place and we follow them to go to the cocktail which takes place in the reception room of the Progress assembly building (MIK 254). Arrived on the spot it’s the turmoil, there is many cosmonauts as well as directors of various units. It’s the occasion to listen a conversation between Leonov and the Russian tourists who accompanied us (we can see on the video the « charming little kids » who ventured on the support tower of the universal launch pad, area 250). The others continue to take photographs while Rui seeks the last cosmonauts for his autographs. Victor give us our invitation then we enter. The room is large, several long tables are installed perpendicularly to the main table. 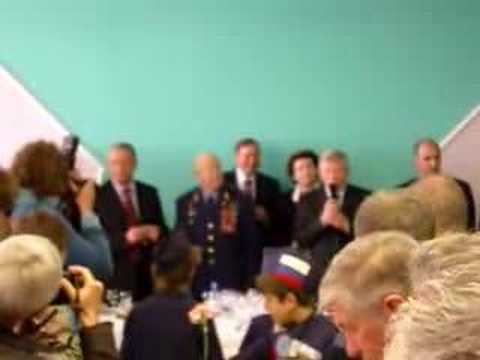 Table for Terechkova, Leonov, Volkov and others. The ambiance is good we eat typically Russian aperitif with a lot of vodka. My discussions with my neighbors are interrupted by toasts of Leonov, or Terechkova. But soon it will be necessary to leave, to go by minibus to return to the hotel. Before we go away we see other cosmonauts, like Krikalev, and make some photographs with them. Once returned to the hotel Victor gives us twenty minutes to take our luggages and to go back on the perron. At twenty o’oclock we all are there and await the minibus which will lead us to the airport, our luggages must travel by another bus (due to lack of place). The minibus is there but we do not leave, we assiste to a bus march, Koreans, people and especially Victor who is running in every directions. Around quarter past twenty one we finally leave the hotel in our minibus and with our luggages. fifteen minutes later the convoy of five buses arrives at the airport. At this time we are not going to leave yet, although we do not pass the customs, the local organisation, which obviously don’t have the habit to see arriving so many people, make us waste an important time. Indeed, from the security instructions it cannot be more than 3 buses at the same time on the tarmac. The Koreans goes first. Our minibus parks on the carpark and they ask us to discharge our luggages, then to reload them fifteen minutes later (interesting activity). Then during one hour and thirty we will not stop making travel from the carpark to the tarmac and way back (sometimes our minibus is allowed to enter, sometimes not), finally at twenty three o’clock we can finally charge our luggages in the compartment of the plane, Tu-154 of the Atlant-Soyuz company. At the plane entrance they check that our names are on a list (what takes a lot of time with foreign names and more with Korean one) then we manage to find a seat. This is not easy because a part of the Korean delegation went on-board with their compartment luggages. The flight was ok, we eat at midnight (brilliant idea!) drinks (vodka like it was water) and we try to sleep. We arrive at Moscow (Vnukovo airport) at two o’clock of the morning. Going through the Visas control and collect of the luggages, we find our driver who has been awaited us for five hours! (what a patience).